This summer, a female friend and I got together to ride bikes — something that we did together often, though generally with more people from our circles of cycling companions. But this time, on a ride that started on a weekday morning and ended in the early afternoon, some of our buddies teased us about having to work and being unable to join us. This experience made me wonder if too few people are investing for the long term and relying on current income to pay bills and make large purchases, whether for a new cycling gadget, an epic trip, or retirement years. I grasp that working in a traditional job doesn't negate saving and investing for the long haul. But the inability to realize that others may have sources of income outside of a regular job cues me to consider that not everyone exercises their talents, interests, and inclinations in a way that's conducive to accumulating and building wealth. Unique talents and gifts may influence financial decisions. Upon further reflection, these exchanges also stirred thoughts about how personal finance — its portrayal in the media and the products that are developed and sold — is often not very personalized. And that lack of customization may prevent some people from fully realizing their potential. We're often told that there's just one way to build wealth. And, if our talents and the circumstances of our lives don't mesh with this one method, then we may think that we're not suited for investing or any form of financial goal attainment. This thought brings me back to a time when a financial adviser scorned me for choosing a catastrophic healthcare policy. He seemed to think that I didn't understand why I needed a comprehensive (and pricier) one like most everyone else. Sadly, he was unable to grasp that my main goal for insurance was to protect against catastrophic loss. I could cover the occasional visit to the doctor, which was typically once or twice per year for each family member. My mom was an RN as was my husband's mother. We may have known how to navigate the healthcare system better than others because of their influences. For example, I knew to make a phone call to inquire about a condition, rather than schedule a visit. In addition, with my mom's constant reminder that “you are what you eat,” I may have had a better grasp on how nutrition affects overall well-being. Those talents, along the good fortune of good health, meant that my use of the healthcare system didn't obligate me to a fully loaded healthcare policy at the time. A one-size-fits-most policy didn't make sense for me. So, I was able to leverage my talents and interests into getting lower healthcare costs. Likewise, decisions about major finance purchases and investments ought to be personalized, perhaps more than anyone realizes. Just as we have unique needs and talents, the products and services we use should be selected accordingly. My talents steered me toward certain investments while avoiding others. As for me and my cycling comrade, it turns out we're both investors. A mutual goal is to build wealth and generate income from our investments. Our mutuality ends there, though. I prefer traditional investing in the stock market and tend to hold investments for several years. She's more likely to sell stocks short. In addition, she owns and rents residential properties while I can barely take care of my own house. I'd love to learn more about real estate investing and haven't ruled out this type of investing for the future. But I know I lack talents that could be useful in this arena. My visual skills are poor so I can't tell if a home is appealing to prospective buyers or renters (though I can crunch the numbers and determine if it's priced right). In addition, I have difficulty doing handy-woman type jobs that can be essential to controlling costs in a rental home. But because I'm good with numbers and have a background in business, I've focused more on what I consider traditional investing — stocks, mutual funds, and ETFs. This approach has been a good one for me. Ignore the messages that only certain types of talents are rewarded financially. Thinking about how my friend and I have expressed and capitalized on our talents makes me want to encourage other women (and men) to express and capitalize on theirs. There's not just one way to generate income, protect assets, and build wealth, despite what you might guess when consuming personal-finance messages. When I was a kid, I heard that the only way to get rich was to own your own business. Then, for a while, it seemed that the best way to prepare for retirement was either work a job with a pension or hold down a job in the same field for 30 years and retire with a million-dollar 401(k). Nowadays, it seems that the best way to reach financial freedom is to snag a high-paying job right out of college, save huge portions of a paycheck for five years, and invest in index funds. Any of these methods could be an excellent method of building wealth and accumulating what's needed to sustain an individual, couple, or family for many years — especially if the children cooperate by getting college scholarships or paying their own ways through college. But people, women in particular, often have unique circumstances and unique talents, which encourage and require more of a mosaic in putting together streams of income and building wealth. Some may work a traditional job while honing talents in stock selection; others may develop a business and rely on index investing; still others may change jobs and careers throughout a working lifetime, piecing together a patchwork of retirement accounts and income streams. There's not just one formula for being successful in investing and enjoying a good life. 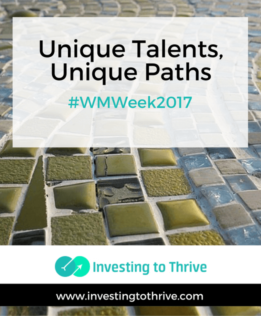 But among the secrets to growing net worth is the ability to identify, embrace, and exercise unique talents.